Introducing our low vision help program at no cost to Oceanport Residents! The Oceanport Lions’ Club is on a mission to help every Oceanport resident that requires assistance with low vision issues. The Oceanport Lions Club for the past 55 years has dedicated the talent of its members and the funds raised from its activities to promoting, for all the citizens of Oceanport. Introducing our low vision help program at no cost to Oceanport Residents. 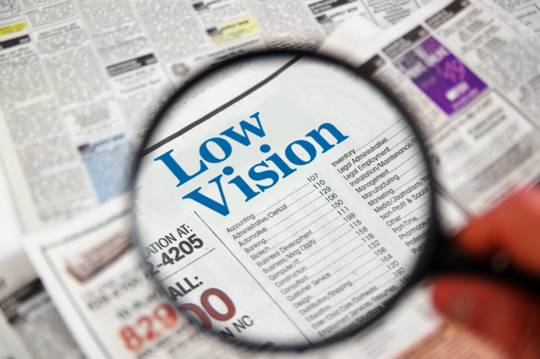 For many of us, low vision is a fact of life as we age. However, it does not have to be a limiting factor in the quality of your life. For many of us, low vision is a fact of life as we age. However, it does not have to be a limiting factor in the quality of your life. The Oceanport Lions’ Club is on a mission to help every Oceanport resident that requires assistance with low vision issues. Listed below are 3 organizations that the Oceanport Lions’ Club works closely with and admires the work they do to help the people with low vision issues. The New Jersey Blind Citizens Association has done tremendous work helping people with low vision or blindness issues. One unique offering of the NJBCA is their CCTV, a device that magnifies text or documents on a large television screen so they could easily be read by low vision individuals. To purchase a new CCTV would cost over $3000 but thanks to the NJBCA, you can rent this device for an entire year for only $150.00. If you or someone you know requires low vision assistance, please let us know. We want to do everything we can to improve the quality of life for you and all other citizens of Oceanport. Feel free to contact Lion John M. Bonforte Sr. with any questions you may have. personal use and others donated to charities. difficult. Participants of this program along with their families meet once a month. Special interest activities and trips to local events, restaurants, and venues. help you or a loved one regain independence. Provides services in the areas of education, employment, independence and eye health through informed choice and partnership with persons who are blind or visually impaired, their families and the community. Lighthouse International – Founded in New York City in 1905, Lighthouse International is a non-profit organization dedicated to preserving vision and to providing critically needed vision and rehabilitation services to help people of all ages overcome the challenges of vision loss. Through clinical services, education, research, and advocacy, the Lighthouse enables people with low vision and blindness to enjoy safe, independent and productive lives. For more info, please contact Amy Lucas. The New Jersey State Library Talking Book & Braille Center (TBBC) provides free public library service to New Jersey residents of all ages who cannot easily read standard printed materials due to a visual impairment, physical handicap or a learning disability.